Listed by the date when they perform, the 100X Club hosts the following talents after the ProRodeo events: Monte Good, Cody Brian Band, South Texas Sounds, Shane Smith & The Saints, Aaron Einhouse, Kirk Baxley, Nick Verzosa, The Spilled Whiskey Band, and Mike and the Moonpies. The KASE/KVET stage will showcase up to 40 musicians and singers throughout the rodeo week. 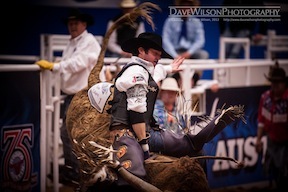 Bull riders are featured, but that’s just the beginning of the fun! Next in line is the national ProRodeo, where viewers will witness the feats of branding artists, bare back riders, steer wrestlers, mutton busters, roping teams, saddle bronc riders, tie-down ropers, barrel racers, and of course, the bull riders and rodeo clowns. Some claim the rodeo as Texas’ official sport. There are plenty of contestants, livestock, and a fan-packed arena for an action-packed two hour adventure. It’s definitely exciting and true to our history of the wild west. One thing’s for sure, the Austin Rodeo is certainly popular to be ranked as one of America’s top 10 ProRodeos! Who could forget The Fair? Carnival, shopping, food, and shows; it’s for the fun of it, everyday from 10 am to midnight during the rodeo, March 14-28, 2015. Games and rides galore – 60+ fun-filled ways to spend the day or night at the Fair. 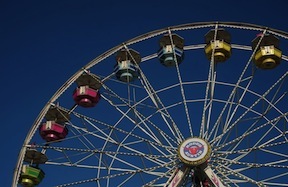 Carnival rides begin at 11am during Spring Break and Weekends, 4pm otherwise. Shop for cowboy attire, furniture, and toys, or get some good ol’ grub at one of the 45 food stalls throughout the fairgrounds where you can use tokens or credit cards. 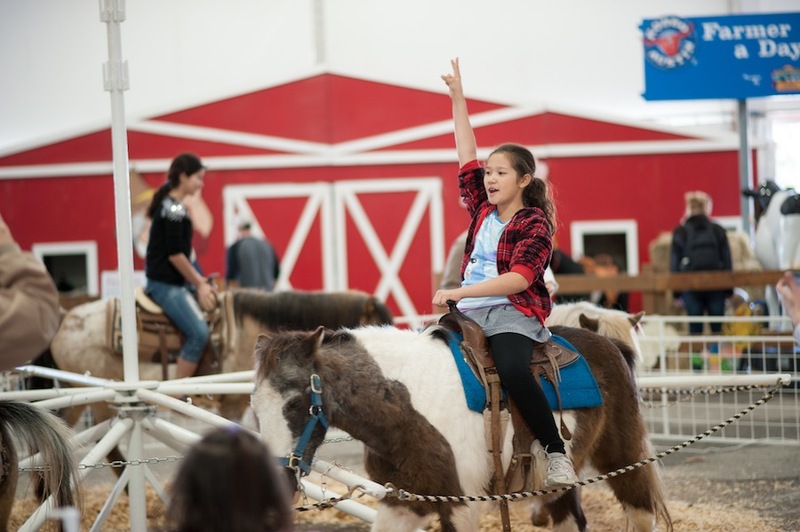 It features the Rocking A Ranch (outdoor music stage, Swifty Swine Pig Races, and kiddy rides), the Wild West Show (roping artist, K-9 kings, mutton-busting, and Ultimate Scramble Championship), and Kidstown (petting zoo, farmer exhibits, tiny tractor maze, and pony rides). Come ride the ponies, see the chicks, and watch the shows! And what would the rodeo week be without the Livestock Show? There are actually over 15 different shows and each is available to see with fairground admission. There are four basic shows: Junior Livestock, Open Livestock, Horse Shows, and the Avenue of Breeds. The Avenue of Breeds will be a great stop for city-slicking homeschoolers, as well as the ranching ones. It’s an educational ranch-o-rama with livestock, horses, and poultry; including a hatchery. All show contestants hope to gain either a ribbon, buckle, or prize money. Youngsters in the Junior Livestock Show compete to win a place in the Youth Auction, showing Market Steer, Market Barrow, Market Lamb, Market Goat, Market Poultry, Junior Breeding Heifer, and the 4-H/FFA Livestock Judging Contest. The Open Livestock Show, which parades the Boer Goats and Texas Longhorn cattle, is open to both youth and adults. But don’t forget a girl’s best friend, her horse. There are three horse competitions: The American Quarter Horse Association Youth Show, Stock Horse Of Texas Show, and the Gold Stirrup. The SHOT show is for university teams, while the Gold Stirrup is the horse show for special needs riders, a time to show how they’ve improved their balance, concentration, and confidence. 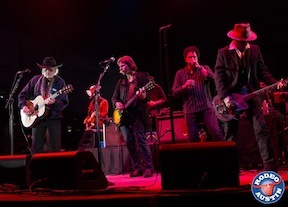 The Austin Rodeo events this March include a Barbecue Cook-Off (3/20-22), the Youth Auction (3/27), and an official close out party that lasts two days (3/27-28). Other special events later in the year will be the Shoot Out Sporting Clay Tournament in October and the BBQ Auction and Dance in November. Events continue into the following year with the Fashion and Fine Arts contest to compete for the Miss Rodeo Austin Scholarship in January, and the black tie event, the Rodeo Austin Gala scheduled for February. See the Rodeo Austin page for a detailed calendar, the ticket pricing, and how you can get involved through donating, volunteering, competing, or exhibiting. Previous Previous post: Kids: Create Your Own App!